In 18th century England, a young boy (Bobby Driscoll) is given a treasure map and sets sail on a ship with a mutinous crew, led by the one-legged pirate Long John Silver (Robert Newton). 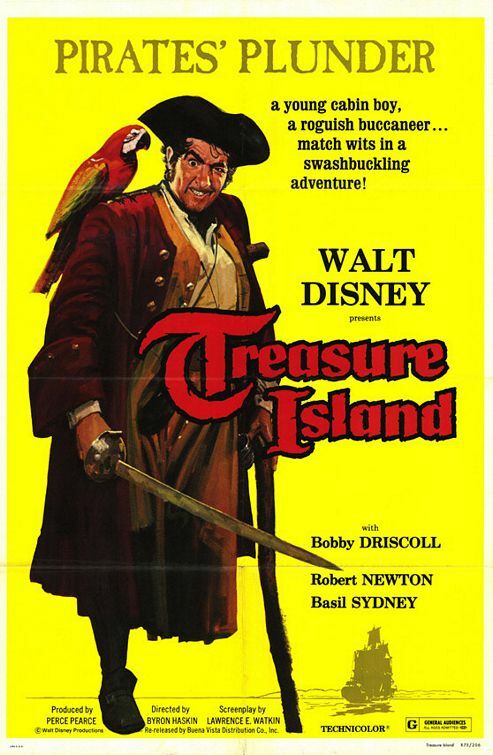 Disney’s first live-action film remains the most famous version among many (including the Peary-recommended 1934 version, starring Wallace Beery) made from Robert Louis Stevenson’s classic 1883 adventure novel Treasure Island. Unfortunately, it takes too long for the action to get started, with half-an-hour passing before the ship even sets sail; but once it does, director Byron Haskin keeps things moving at an energetic clip, with plenty of exciting action sequences and life-threatening encounters. Disney veteran Bobby Driscoll (star of 1946’s Song of the South) is appropriately mature as young Jim Lively (who gets to experience a coming-of-age adventure most boys only dream of! ), and he’s surrounded by a cast of colorful supporting actors — most notably Robert Newton as Long John Silver, who, as described in Channel 4’s capsule review, “brings exactly the right combination of cruelty, foppishness and brio to his performance”. Yes, simply to see Newton in perhaps his most iconic role.